Welcome! Bienvenidos to Hostel Revolution - a friendly, small, chilled Backpacker hostel in the historical part of Quito. Our hostel was created by Backpackers for Backpackers and provides an excellent base for travellers who would prefer to stay in the Old Centre of Quito. The La Mariscal area (Gringolandia) with its bars and international restaurants is only 10 minutes away by cab or bus. From our hostel you can visit Quito’s best asset - its beautiful Historical Center. All the main sites and attractions are within an easy 20-30 minutes walk! Our location near Park Alameda also gives our clients easy access to the 3 main bus lines. These are the Trole line (green stations), the Ecovia line (red stations) and the Metrobus which runs along Avenida América. 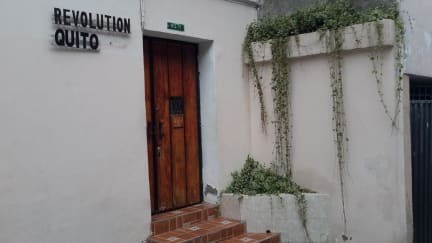 Hotel Revolution is a small capacity (22 people) chilled out hostel in the historical part of Quito. HR is in a colonial type house with wooden floors & decorative plaster ceilings. We have several common areas: a comfortable TV lounge with lots of DVDs, a rooftop terrace with tables and a great view, and a bar/common room where you relax over a few drinks and socialize. 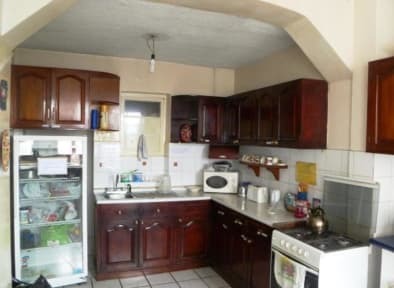 Guests who want to save money and cook their own meals can make use of our fully equipped kitchen. We offer free coffee and tea to all of our guests. We have two computers with internet access for guest usage and free Wi-Fi is available throughout the hostel. We have plenty of bathrooms and showers with lots of hot water. Our hostel provides a non-smoking indoor environment. Smokers can use the balcony or the terrace. from the airport with us so you can check-in to the hostel after 23:00. * There is some noise from passing traffic as Los Rios is a major street. * A Valid passport is required by all guests. Hands down the best hostel I've ever stayed at! Perfect location, walking distance to downtown, or a very short cab/uber ride. Comfiest bed I have ever slept on in a hostel. Real pillows, and a real comforter! Sandra is the best host, cooks an awesome breakfast in the morning, and more than willing to help guide, give directions and suggestions. Super clean and peaceful environment yet close to all the attractions. CANNOT RECOMMEND THIS PLACE ENOUGH. Must stay if in the Quito area. I cannot speak highly enough of Hostel Revolution. The first part of our stay, I enjoyed the breakfasts, pub quiz, and general friendly atmosphere. When my partner became ill and had to be hospitalized in Quito, that's when Sandra's hospitality really shone. She let me use her WiFi and even her phone, and was always concerned to hear how Trish was doing, even when we were no longer staying there. Sandra is a real friend in Quito and I would recommend this place to anybody. I would really recommend the revolution hostel! It’s a nice and quiet hostel with all the things you need. Sandra is super helpful and sweet. I would definitely come back here. Awesome hostel, beds are very comfy. Sandra is a super host, makes you feel like home. Very friendly and nice hostel, clean quiet, breakfast and coffee are good. Staffs are nice and helpful. It’s not for party which is good for people like me. Everything was ok but nothing especially nice. No locks on the bedroom doors but there are lockers in the room. Atmosphere is ok but not very warm. The Croatian owner is a bit austere.